Free running is all very well, but we've all got different goals and circumstances. Some run to lose weight, others to boost their aerobic fitness, while speed is the top priority of the more experienced. Either way, there are gadgets that can help you get through the run - from tiny MP3 players, wireless headphones and the latest in running-centric trainers, armbands and backpacks - to those that help you monitor your progress. Think activity trackers, GPS watches and heart rate monitors. Don't load yourself necessarily with gadgetry, but instead choose wisely and concentrate on that one product that will motivate you, and keep you on track to achieve your goals. Here are some of the best running gadgets around, that you might like to buy. Echewing GPS watches and activity tracker armbands for a free app such as RunKeeper, Endomondo Sports Tracker or MapMyRun is fine, but where will you put your phone? A downright awkward gadget to carry while on a trail, Griffin has come up with a simple armband that keeps a smartphone dry and out of the way. An ultra-lightweight nylon band that easily adjusts in diameter, its moisture wicking claims are less impressive than its ability to stay in place. Some won't like the restrictive feeling on their upper arm, but there's no doubting its usefulness. As well as easily trailing headphones through a t-shirt sleeve, there's a port for connecting the Adidas miCoach Connect heart rate monitor - hence the otherwise irrelevant branding tie-up. But our favourite feature? A tiny key holder that snaffles away that essential - though irritating - running companion. 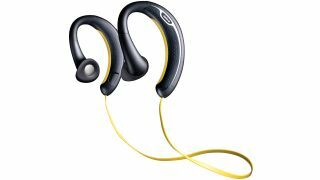 Though boasting a rather odd design, it's good to see a running-specific pair of earphones. The sweat and water-resistant - and even washable - Sennheiser Adidas PMX 685i Sports neckband headset is worn across the back of the head, thereby avoiding the back-and-forth of a headband, something that automatically makes then suited only to running. It's not just about fit. The actual tips of the earphones take a slight step back to avoid blocking out all noise - crucial if you're running along roads - though still manage to deliver full, bassy sonics. Crucially, there's a cable clip for clothes, and an in-line remote control on the audio cable that operates volume and navigation and enables you to answer phone calls on the move. Probably the most versatile - as well as the tiniest - backpack we've ever used, the Berghaus Limpet 10+ is ideal for trail running. It's made from a reflective waterproof fabric and sits snugly on a back, thanks not only to the shoulder straps, a chest fastener and waist straps (rare at this small size), but also to mottled foam pads that create some airflow in the centre, thereby reducing sweaty back syndrome. Mesh pockets on the outside are handy for sunglasses and liquids, while inside an elasticated pouch can take a hydration pack. That's all perfect for trail running, though the Limpet 10+ does a decent all-round job, too. It's zip-expandable around its hull to increase load to 15 litres, while that elasticated pouch is perfect for a 10-inch netbook or tablet. OK, so you're not going to be watching much video, but this tiny MP3 player weighs just 51g (1.8oz), which is perfect for stowing in a pocket or armband while on the move. With an FM tuner and a generous 8GB of storage - though sadly there's no microSD card slot for upgrading - this Walkman plays music for a stunning 36 hours and video for over five hours on a single charge. It even has a handy SensMe mode that presumably uses BPM data to play only fast-paced tunes in 'workout' mode.